Our 10th annual Treasures in the Sand was held on Sept 7 & 8, 2018. 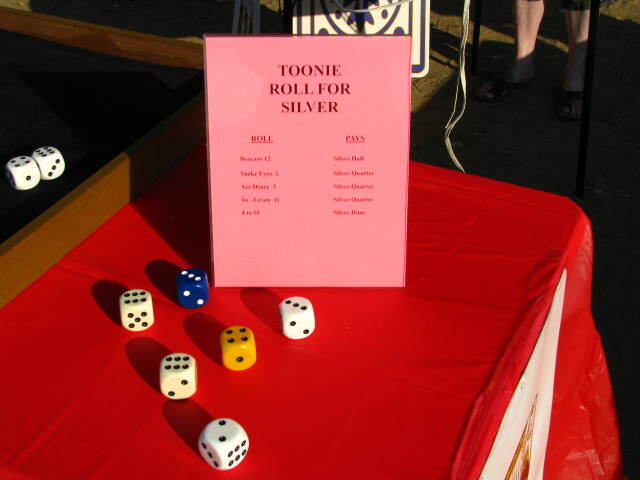 For the ​10th​ anniversary (our “tin” anniversary), we were transported to the Land of Oz with Dorothy and her friends. 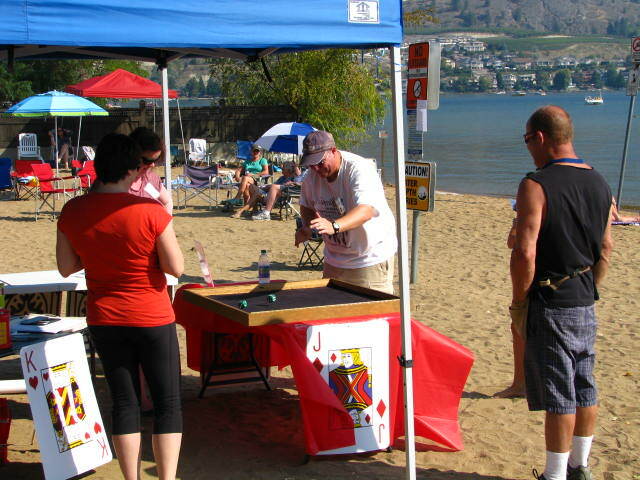 With a little imagination, our usual hunting grounds at Sudbury Beach on Skaha Lake in Penticton was transformed into a (sandy) Yellow Brick Road. 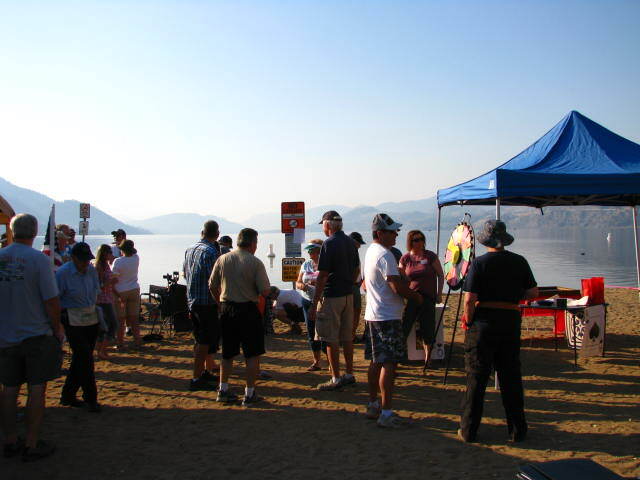 We had a crowd of about 125 people at our tenth year, some of whom have been attending since the first year! 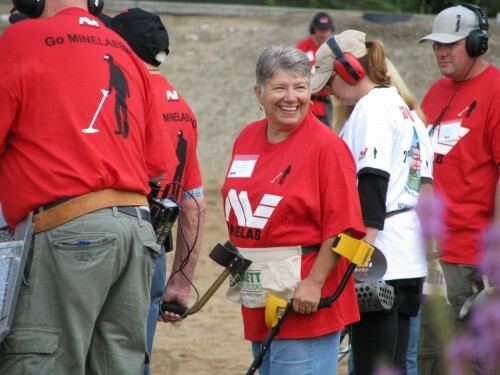 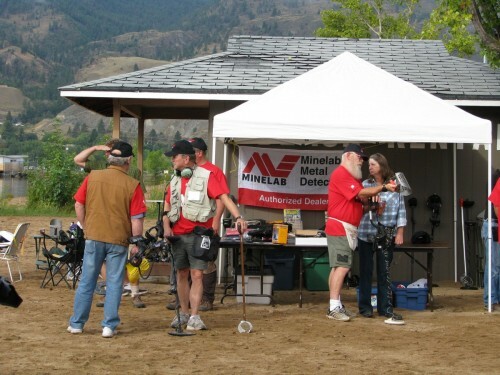 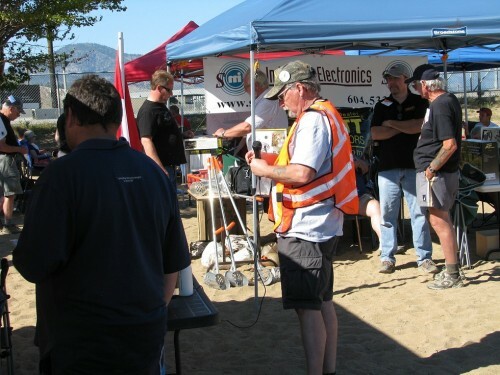 Debbie Smikoski, the Business Development Director at Minelab, was a special guest at the event and gave our attendees helpful advice on using their equipment. 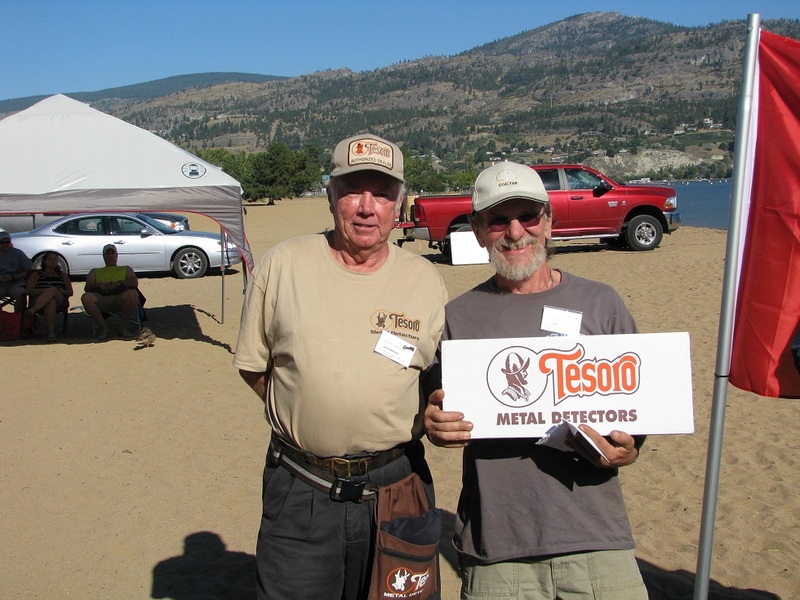 We are grateful to all of the Detector manufacturers for their contribution to our hunt: Garrett, White’s, Tesoro, Fisher, and Minelab. 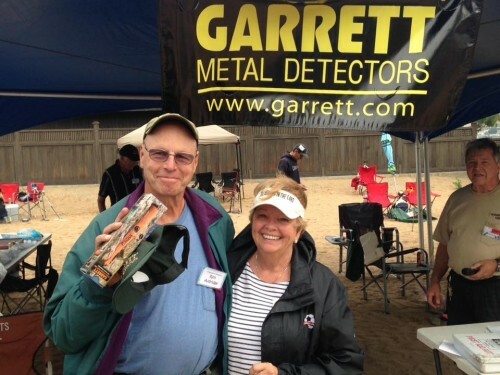 Detectorists began hunting in the dark on Friday night. They detected valiantly through a drizzle of rain and a haze of smoke. The rain, fortunately, was just what we needed to clear away the remaining smoke from the summer’s fires. 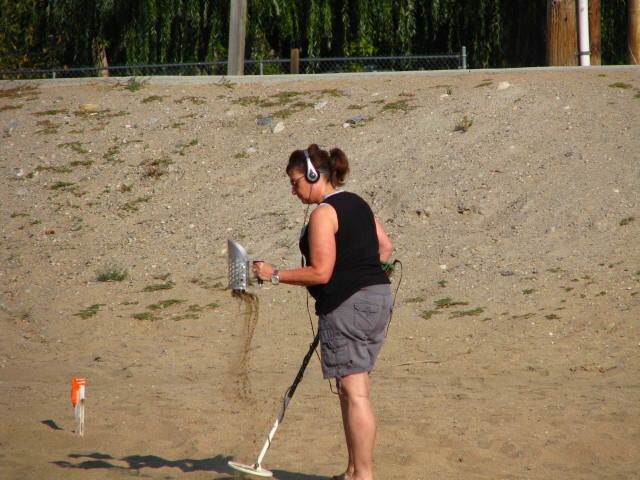 Saturday turned out to have the perfect weather for metal detecting. Detectorists participated in three hunts throughout the day: The Scare Crow, Tin Man, and Lion hunts. 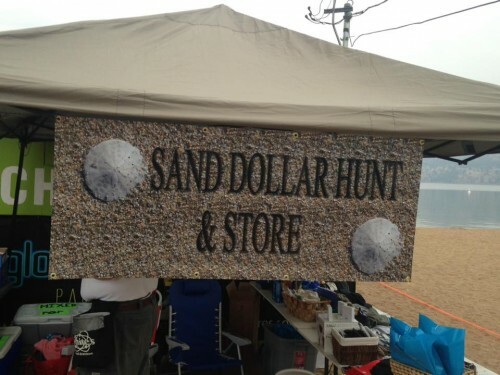 Waiting to be found were many clad coins and prize tokens. 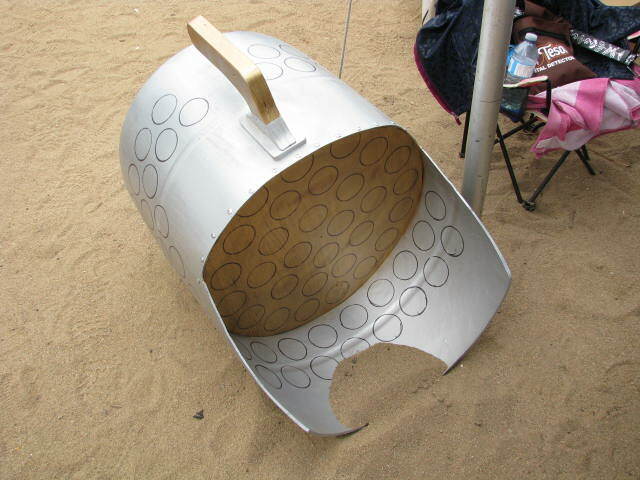 The Wicked Witch of the West hid the coins so well that many were still left over at the end of the day! 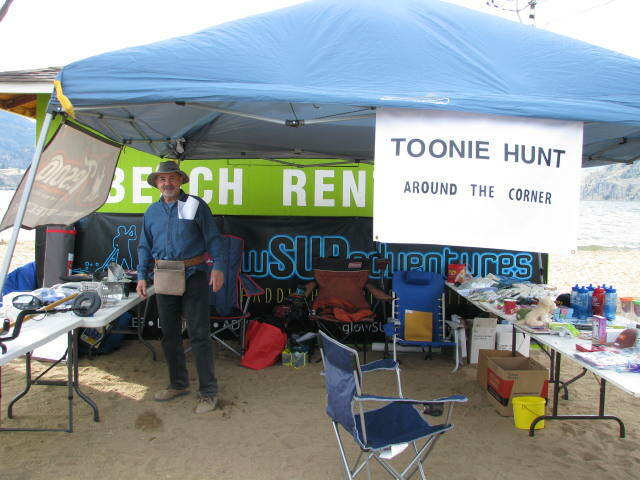 Aside from the hunts, entrants had many other fun opportunities to explore. 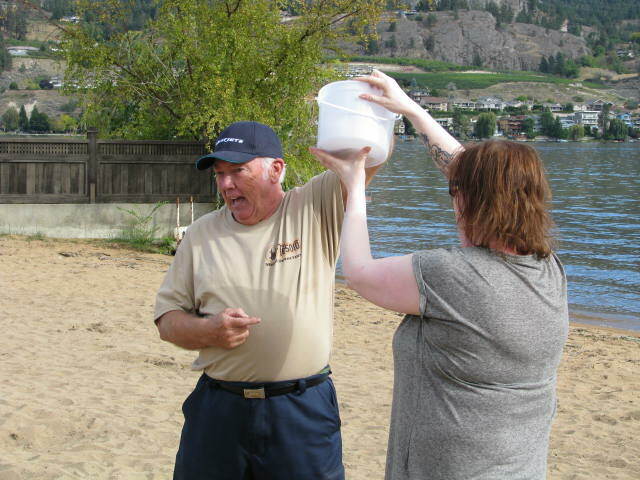 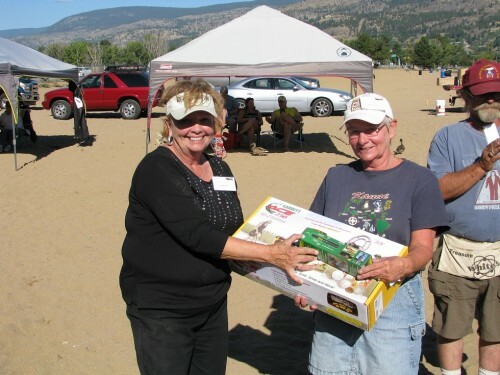 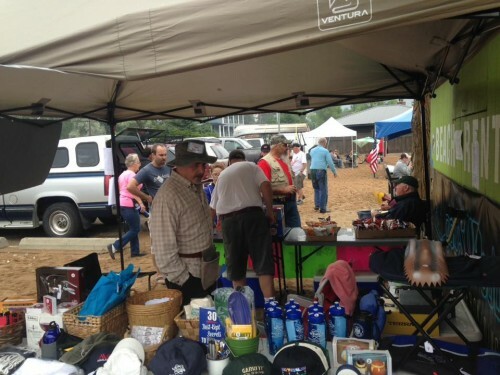 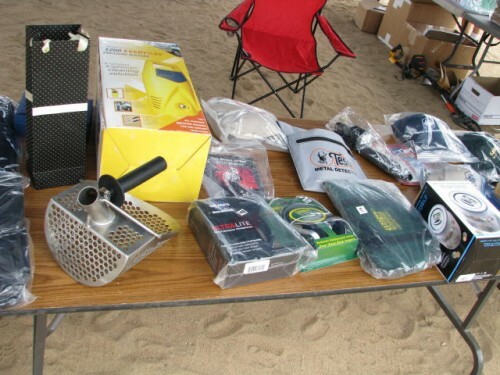 The Vernon Placer Miners Club offered gold panning; the Sand Dollar Hunt ran all day, and the sand dollars collected could be used to purchase prizes and even be used like real money for the silent auction and other events! 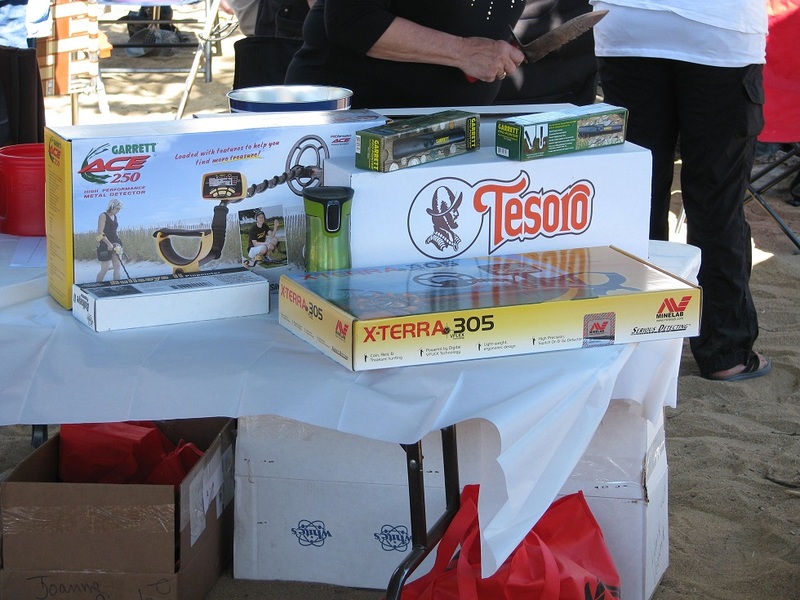 We also had a “Wheel of Fortune” and a silent auction with over 40 items. 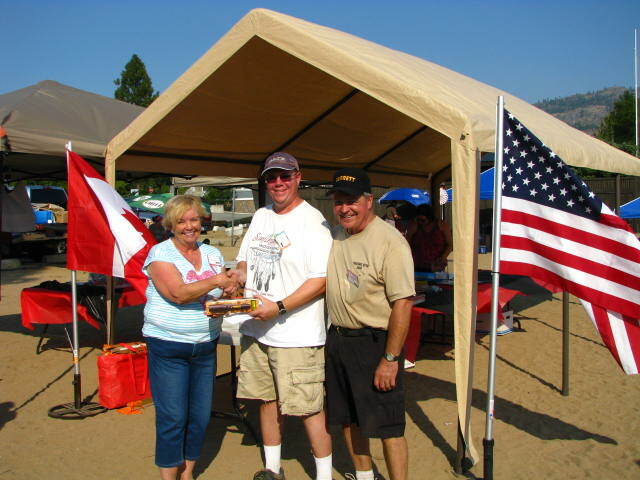 We conducted more raffles for silver coins and bars this year. 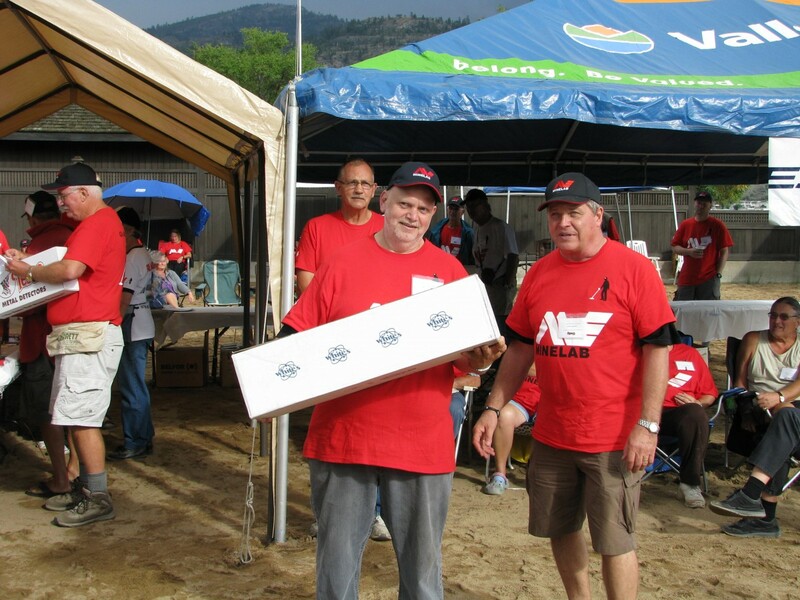 Once more, WestJet graciously donated two tickets to anywhere they fly, with 100% of the net proceeds from raffle ticket sales donated to the Penticton Regional Hospital. The lucky winner of the tickets was Rick Ponich of West Kelowna. To date, we have donated $37,300 to the Penticton Regional Hospital! 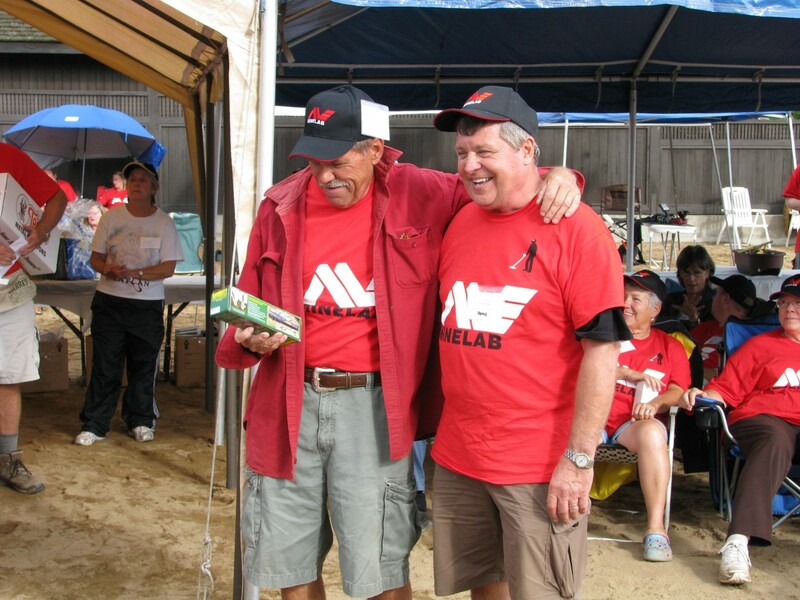 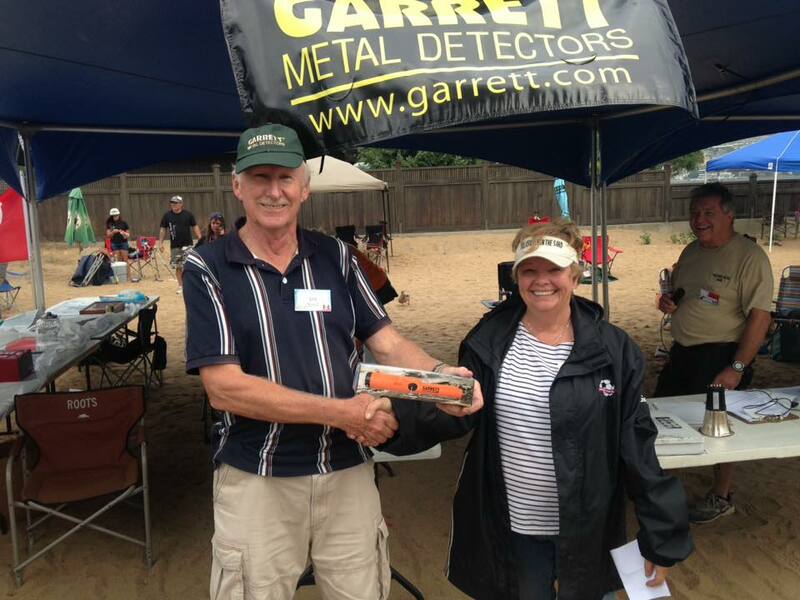 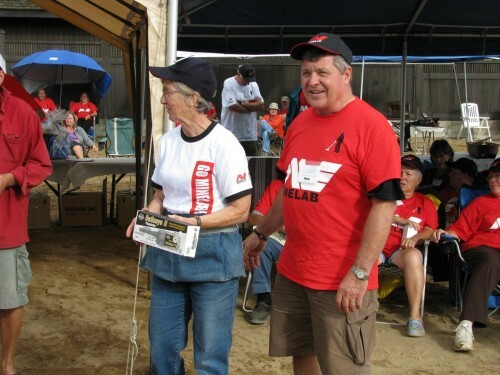 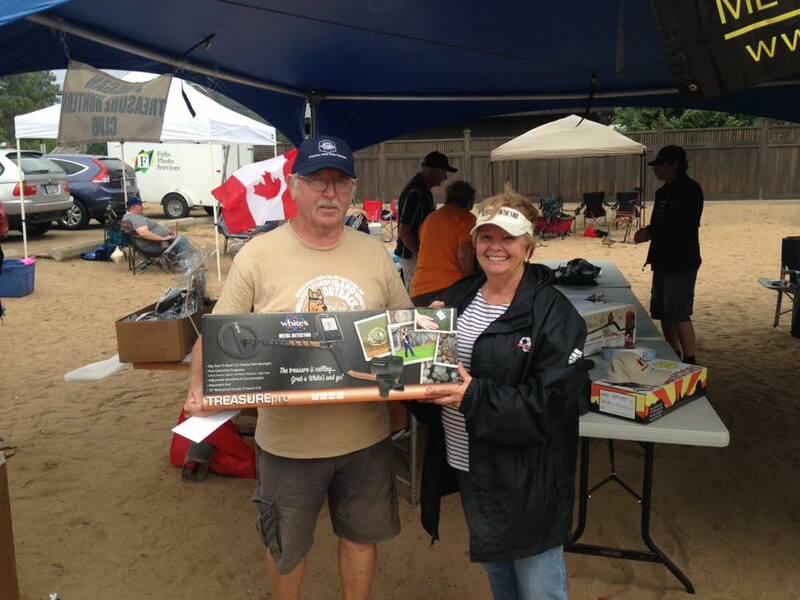 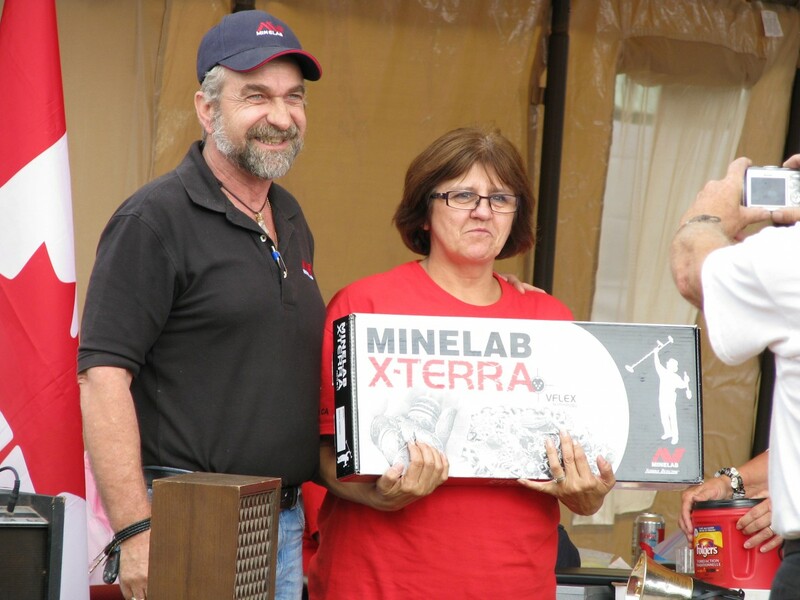 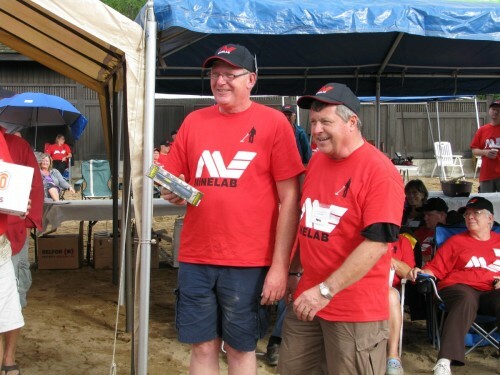 A special Draw for a Minelab Go Find was also held for all registered contestants and was won by Raylene Bremner. 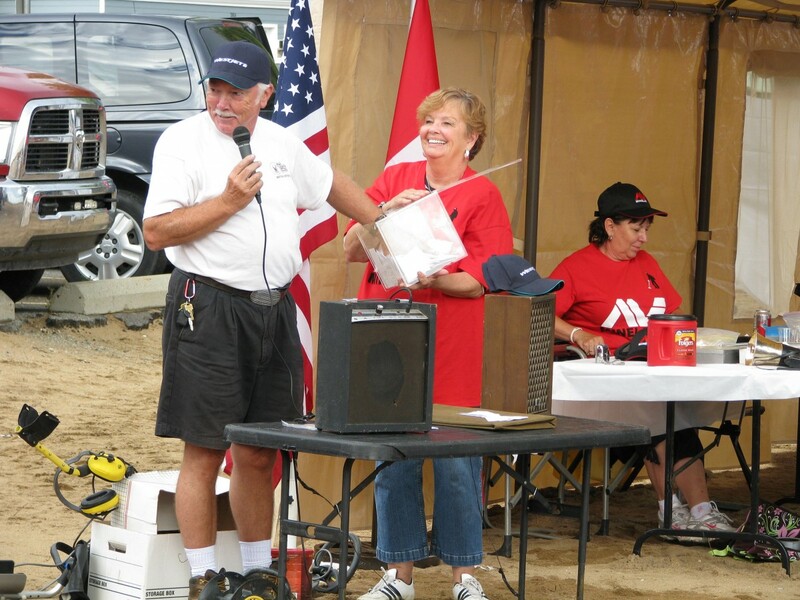 During closing ceremonies, attendees were treated to a special performance by Dorothy and the munchkin: a special rendition of Somewhere Over the Rainbow with lyrics all about the hobby we love: metal detecting! The whimsy of the Wizard of Oz theme made this year especially memorable. 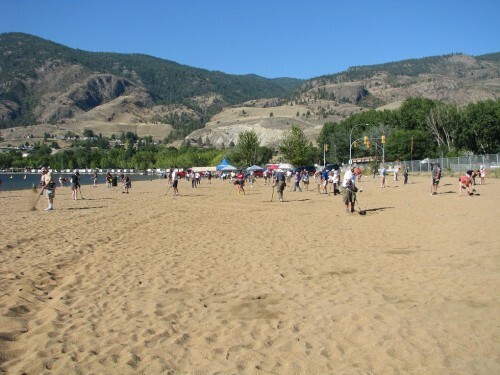 We cannot wait to see you all again next year! 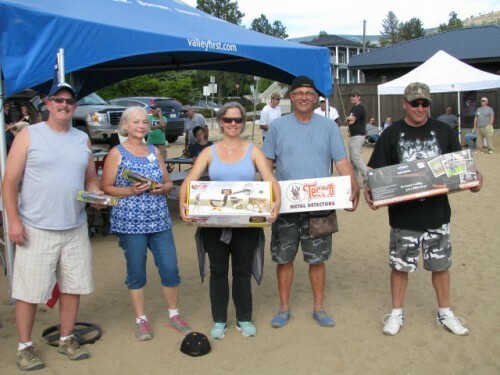 Our 9th annual Treasures in the Sand was held on Sept 8 & 9, 2017, at Sudbury Beach on Skaha Lake in beautiful Penticton, BC. 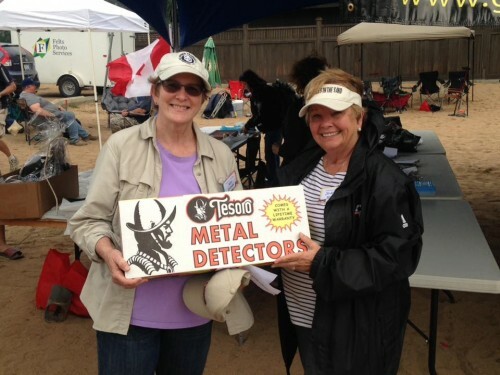 This year’s hunt started in the dark with a night hunt on Friday – lots of fun. 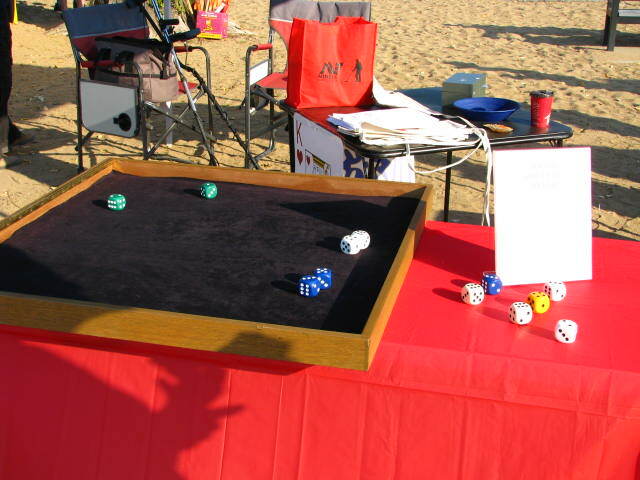 Saturday was a little windy, but warm & the sun did finally break through. 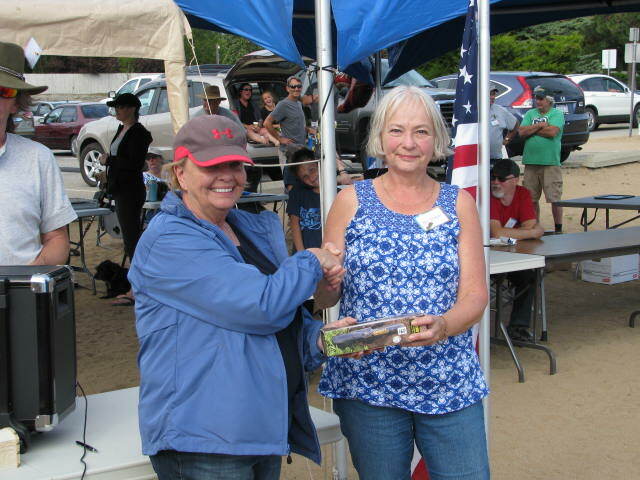 After morning coffee and treats, there were two 30 minute hunts with lots of clad coin & tokens for Metal Detectors, Silver & other prizes, followed by a scrumptious catered lunch. 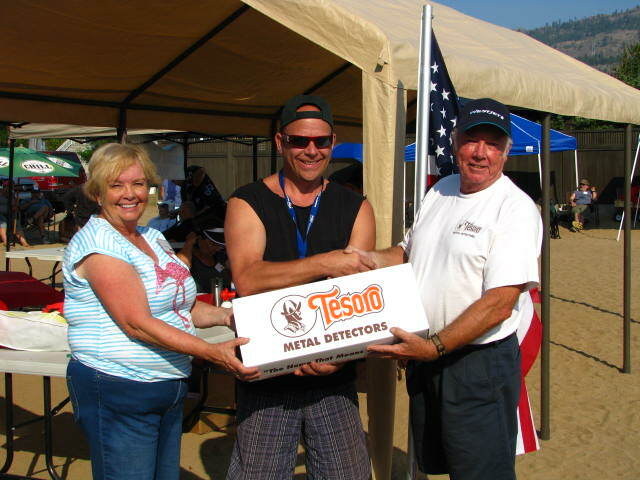 The afternoon hunt was the “Sharon Vodarek Memorial Treasure Hunt”. 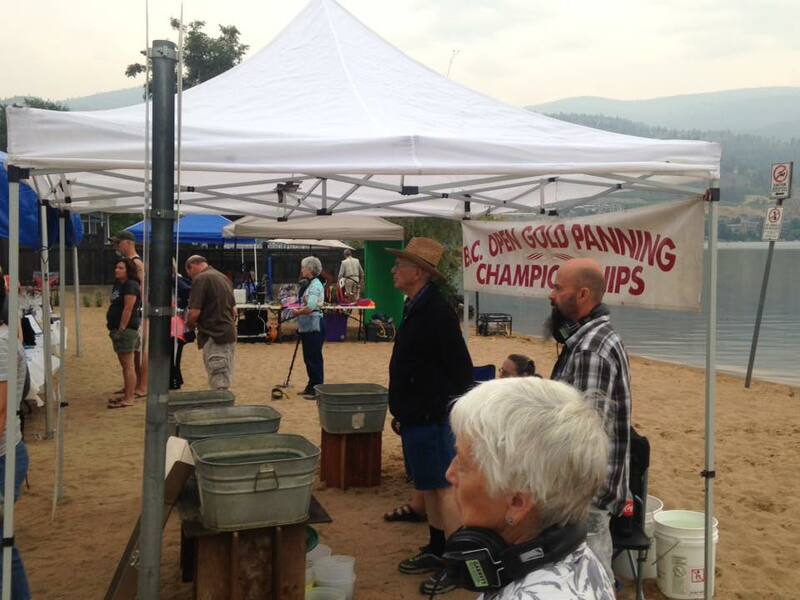 This year, entrants were also given the opportunity by the Vernon Placer Miners Club, to try their hand at gold panning. The new Sand Dollar Hunt ran all day and the sand dollars collected could be used to purchase prizes and other goodies. 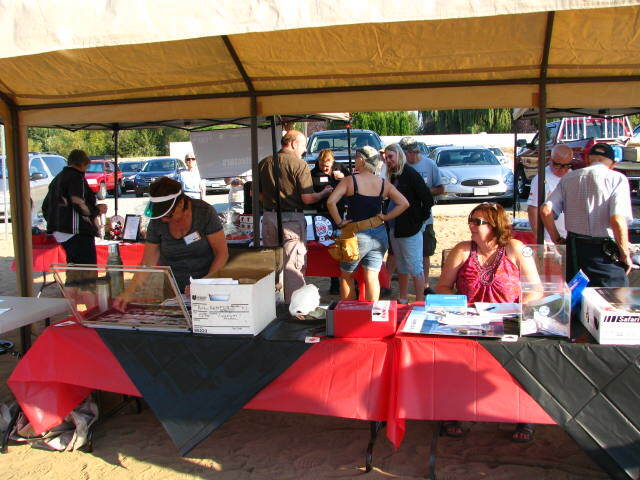 Others took part in the Silent Auction or enjoyed getting their photos taken at the photo booth. Once again the Silent Auction had some fantastic treasures and there was the ever popular “Treasures in the Sand Chest” & special prizes. 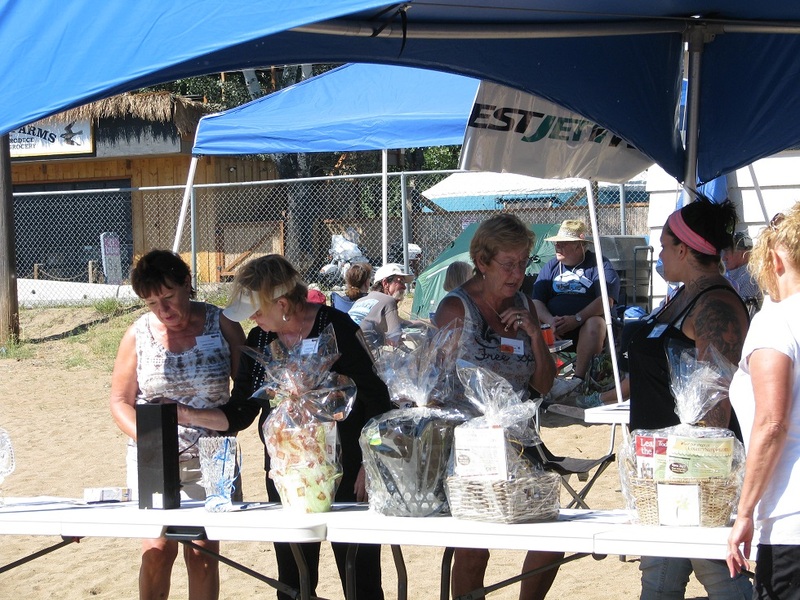 Everyone also really seemed to enjoy the Raffle for Silver Coins & Silver Bars. 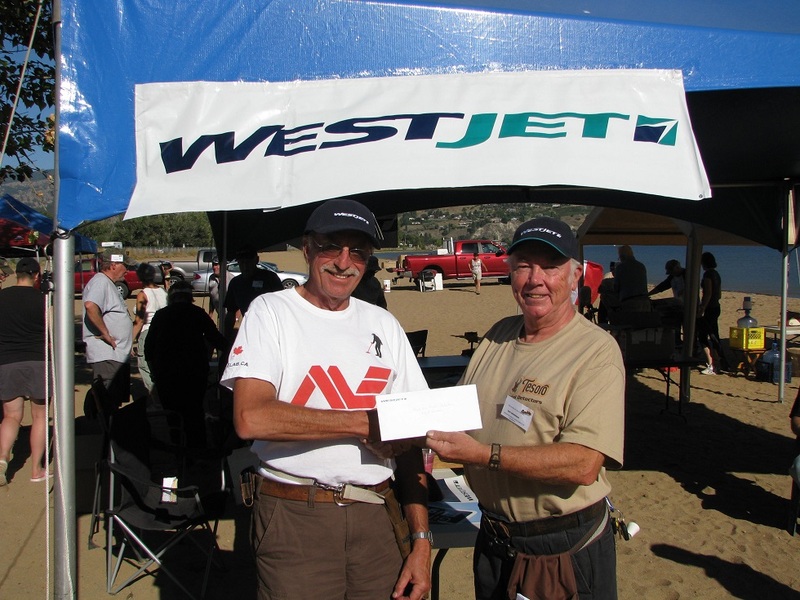 And the final highlight was the draw for 2 fully paid, round trip air flights, to wherever WESTJET travels, with 100% of the net proceeds ($4,000) donated to the Penticton Regional Hospital. 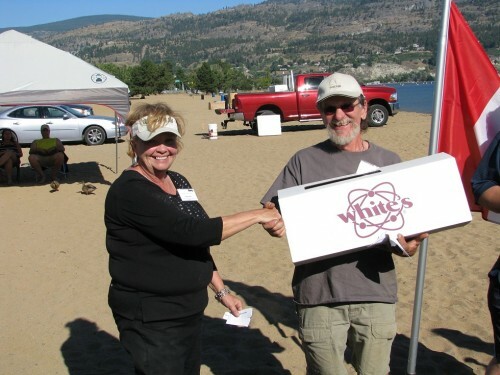 The lucky winner of the WestJet Tickets was Deb Jones of West Kelowna, BC. 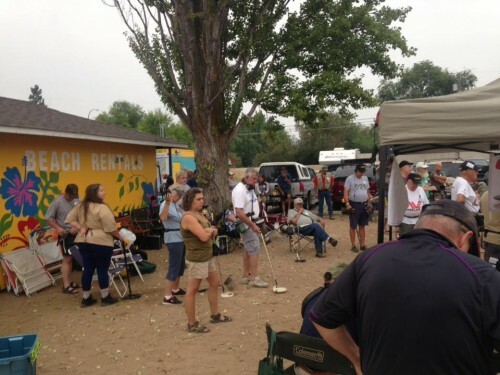 Thanks to all who came from near and far to make this hunt so much fun. 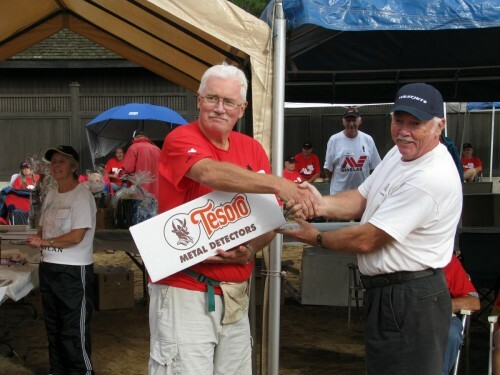 Looking forward to next year’s hunt, when we celebrate our 10th year! Our 8th annual Treasures in the Sand was held on Sept 9 & 10, 2016, at Sudbury Beach on Skaha Lake in beautiful Penticton, BC. 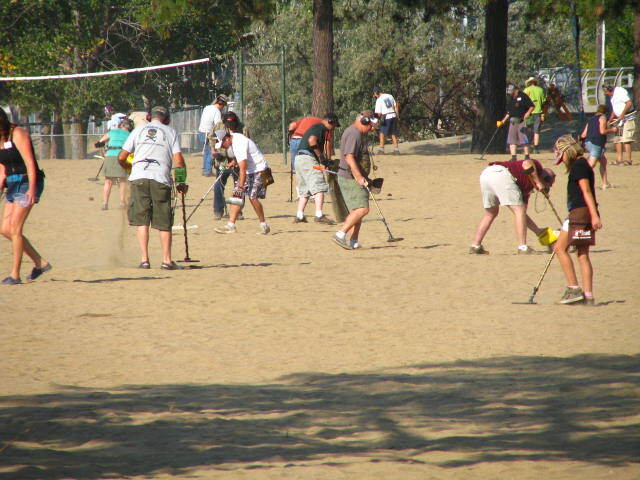 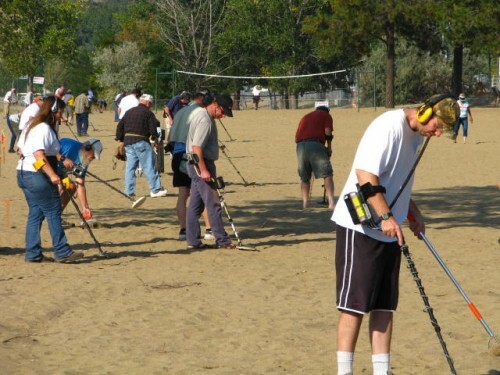 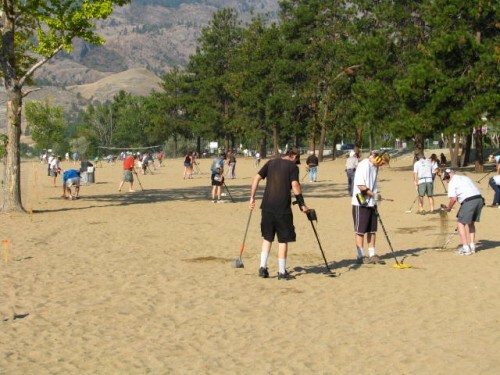 And this year’s hunt theme was “The Buried Treasures of the Pirates of the Okanagan”. We included a Friday night hunt again called “Blackbeard’s Fun Hunt” and entertained 35 hunters who managed to find all the buried treasures in the dark. On Saturday, 67 hunters took part in 2 hunts in the morning (“Black Bart’s Lost Treasure” and “Long John Silver’s Booty”), which included clad coin, silver and prize tokens. 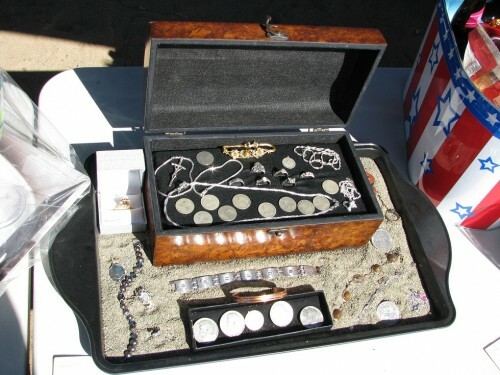 We all then stopped to enjoy a wonderully catered lunch and then were off to the 3rd and final hunt in the afternoon (“Calico Jack’s Cursed Coins”), which included clad coin, silver and lots of surprises. 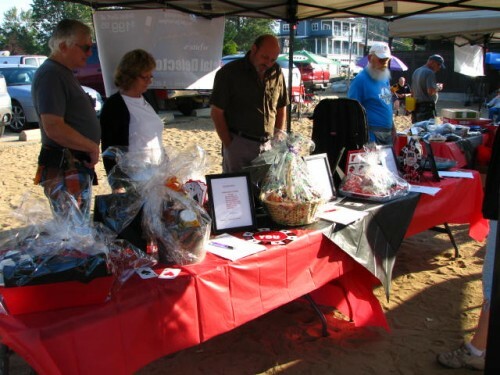 Throughout the day, others took part in the Silent Auction, as well as the Toonie Hunt. 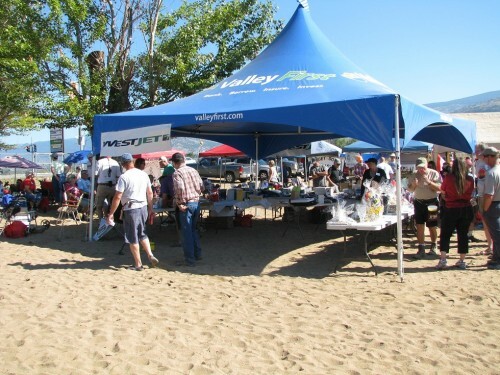 We once again sold WestJet raffle tickets, with all proceeds donated to the Penticton hospital, bringing our donated grand total this year to $28,870.00. The lucky winner of the WestJet Tickets was Laura Jaster of Peachland, BC. 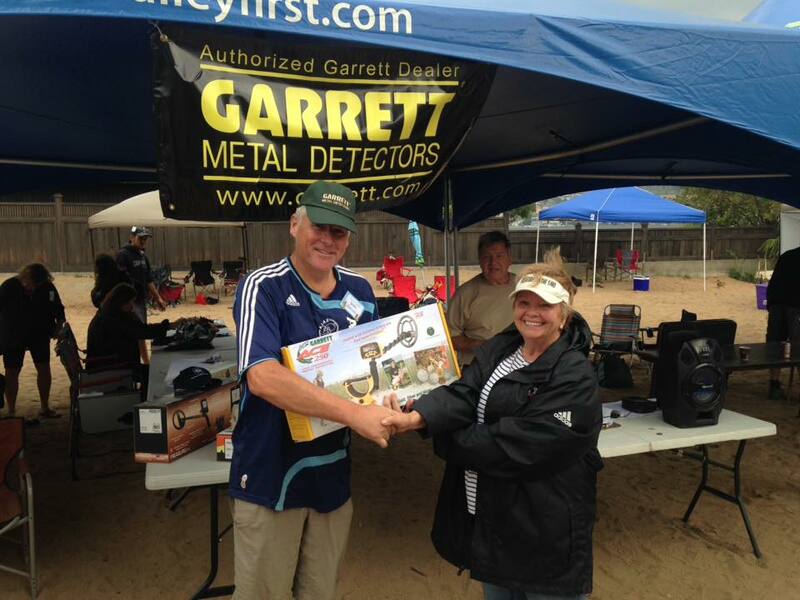 Thanks to all who helped out at this year’s hunt and here’s to making next year’s hunt even better. 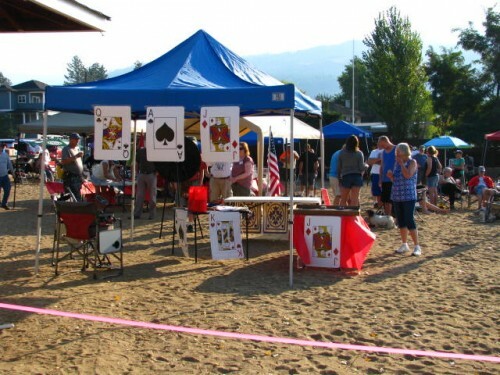 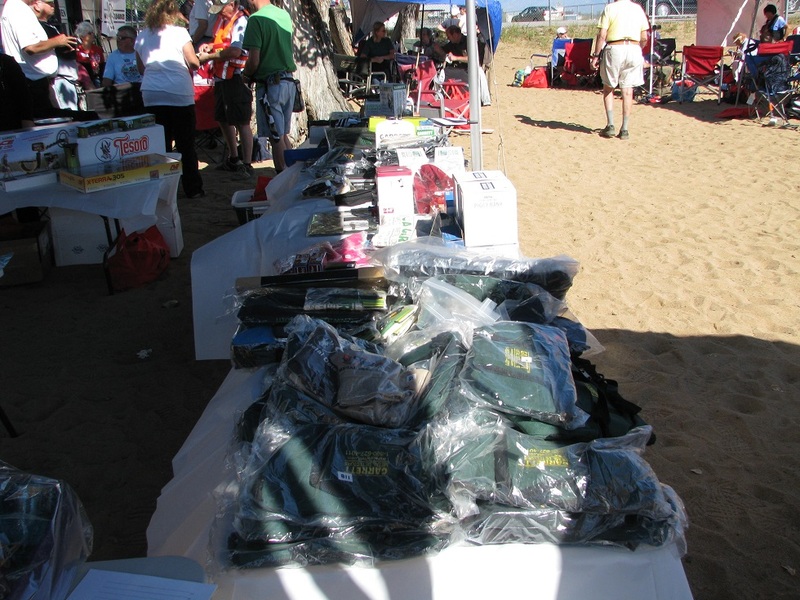 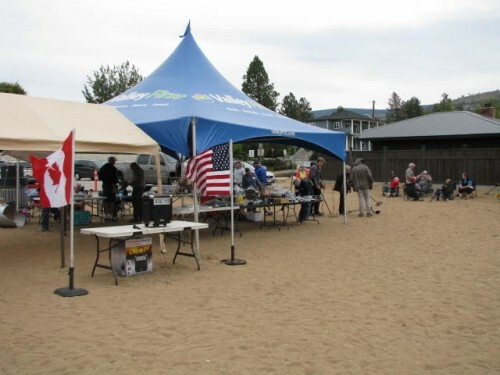 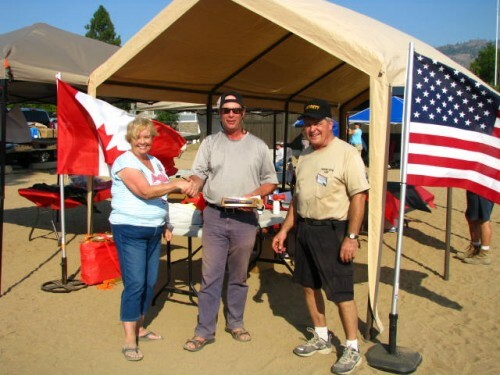 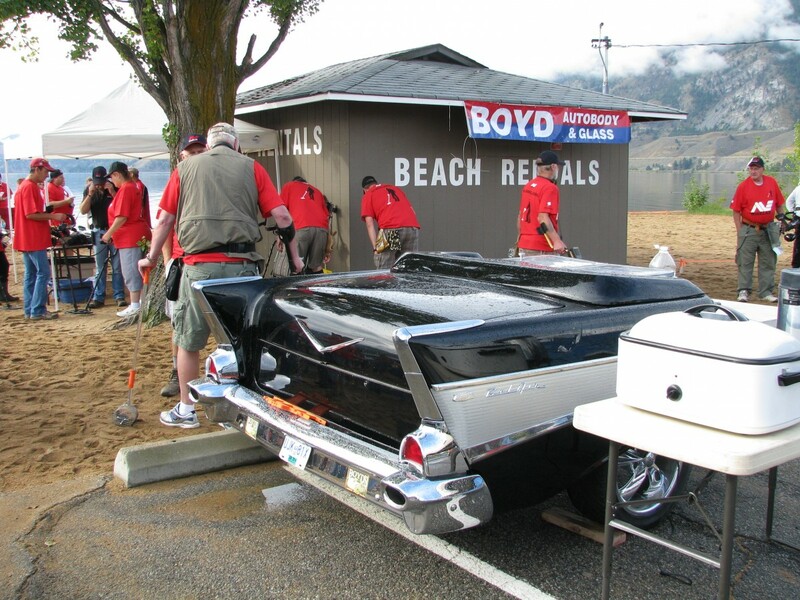 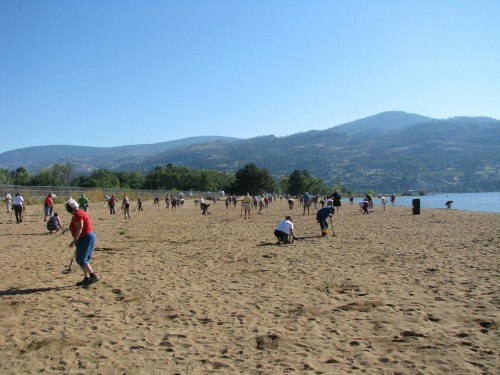 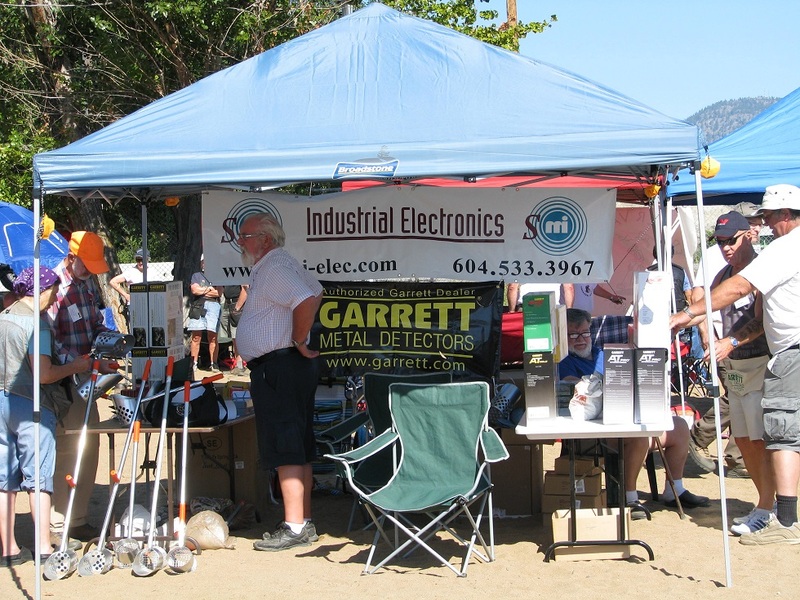 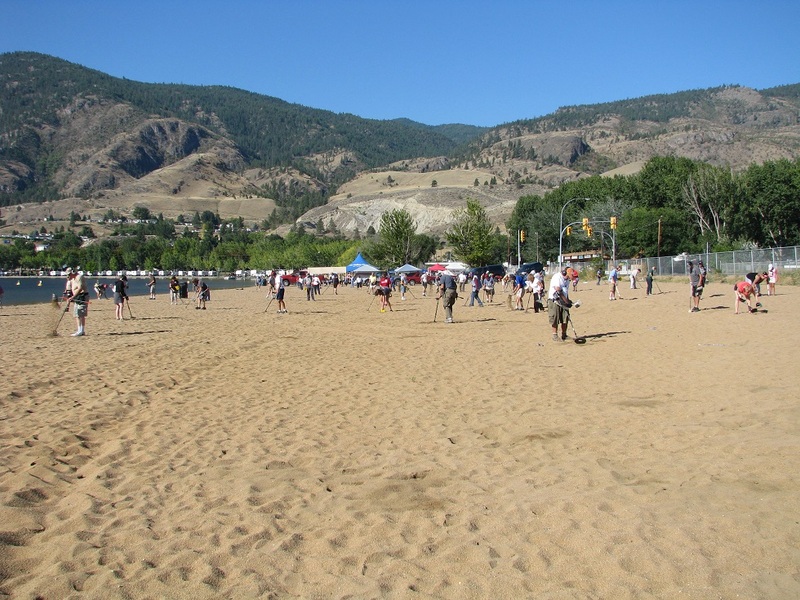 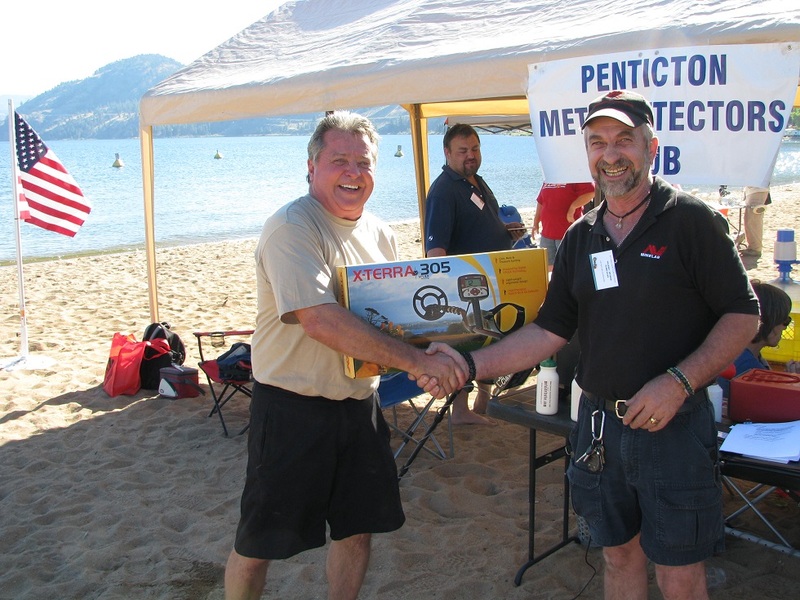 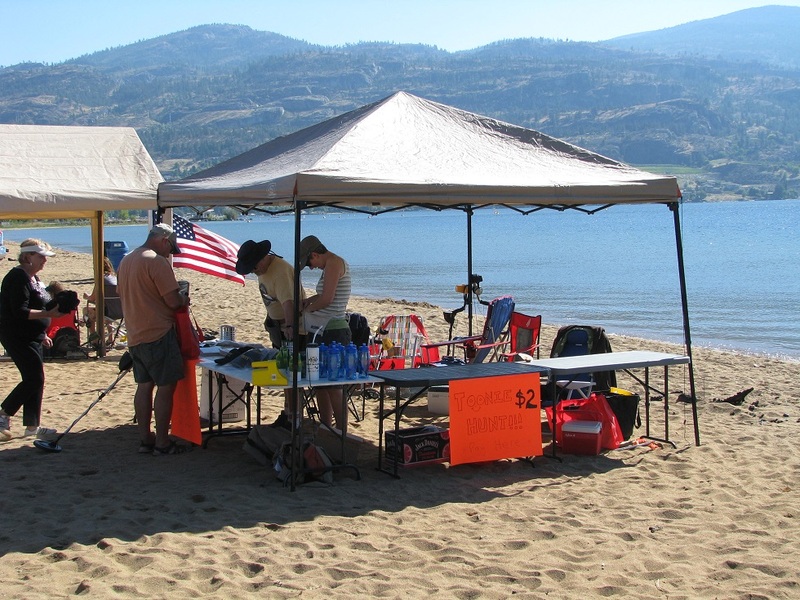 Our 7th annual Treasures in the Sand was held on Sept 11 & 12, 2015, back at Sudbury Beach on Skaha Lake in beautiful Penticton, BC, and the weather couldn’t have been better. 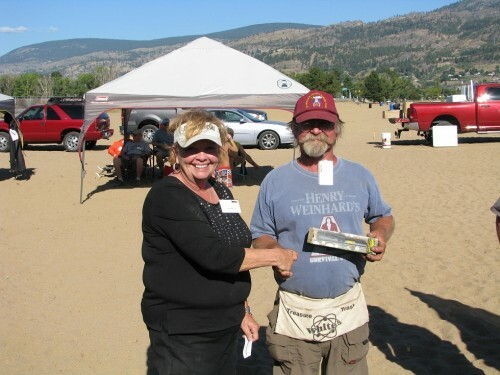 We included a Friday night fun hunt again this year with quite a few registered hunters. 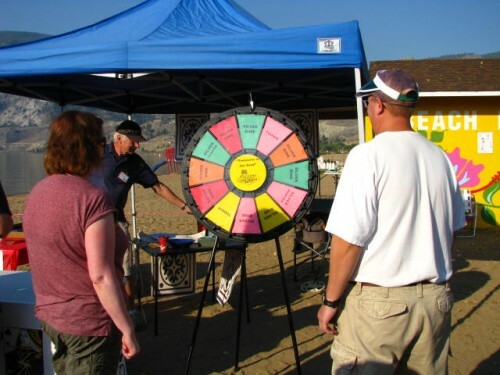 A major prize of a Pin Pointer was handed out, with many other smaller prizes, all of which were won by those who found the most “interesting” of buried items that turned out to be tokens. 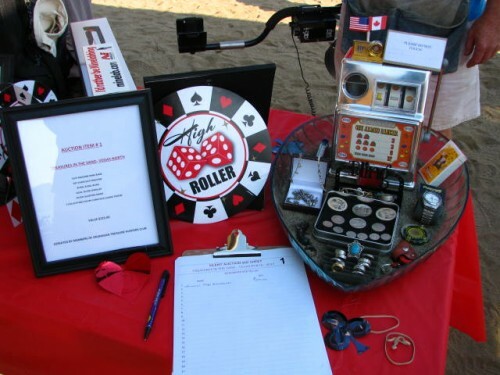 This year’s hunt also had a Vegas theme (Treasures in the Sand: Vegas North) and many people enjoyed trying their luck with the roll of the dice or the spinning of the wheel to win various types of silver coins. 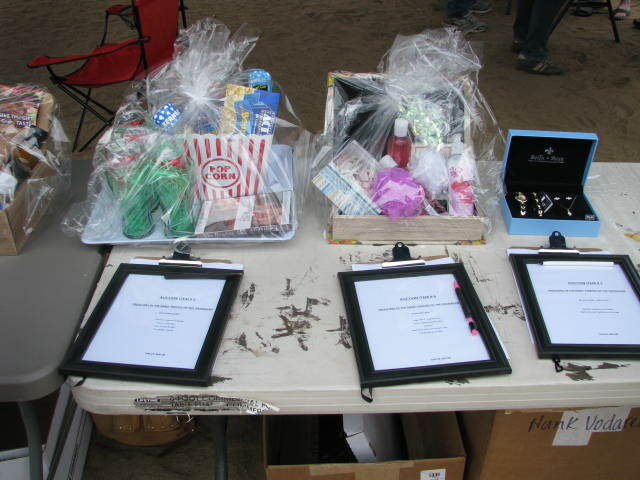 Others took part in the Silent Auction, as well as the Toonie Hunt and it was amazing the prizes that people walked away with. 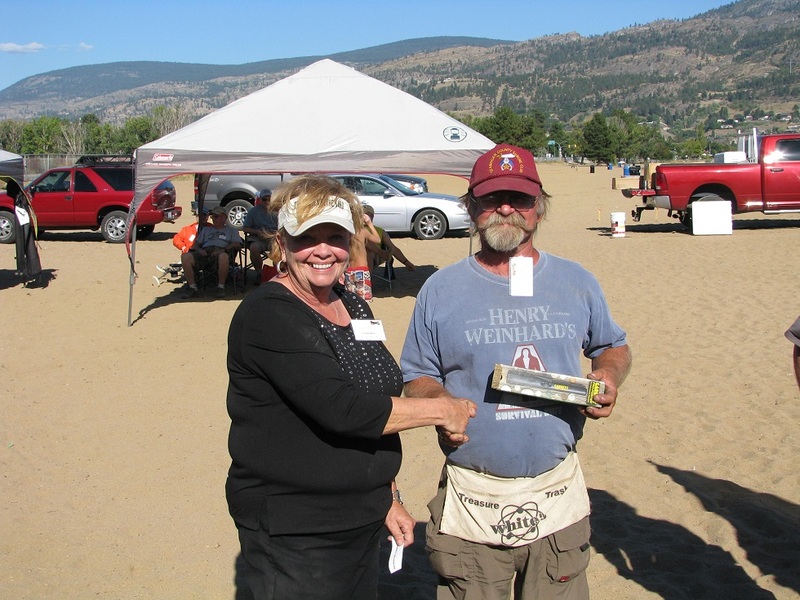 The first and second hunts of the day on Saturday included clad coin, silver and prize tokens. 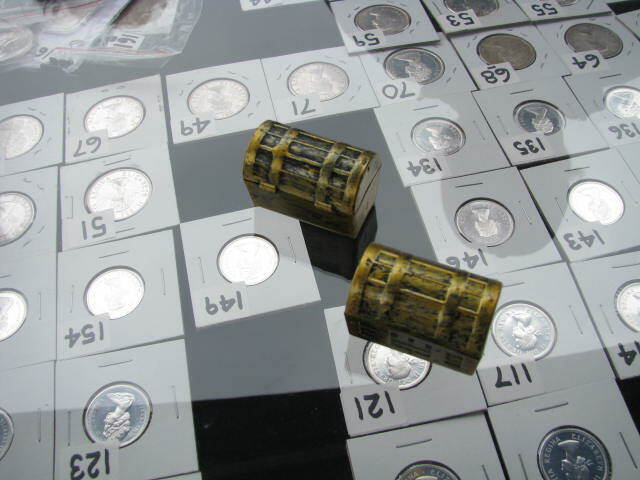 After a wonderful catered lunch a third hunt was held that included clad coins, tokens for silver and lots of surprises. We once again sold WestJet raffle tickets, with all proceeds donated to the Penticton hospital. 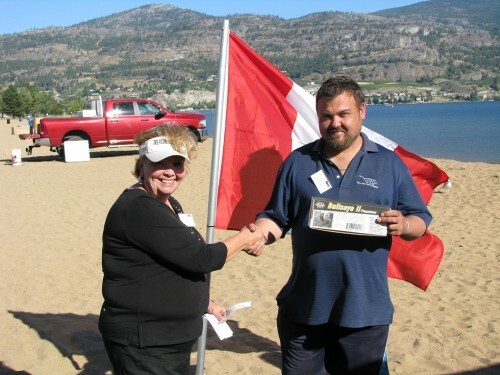 The lucky winner of the WestJet Tickets was Tracy Redman, Nanaimo BC. 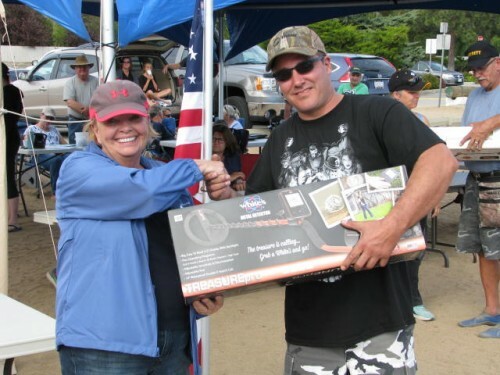 She was reached by phone at the hunt and was overjoyed to find out she had won. 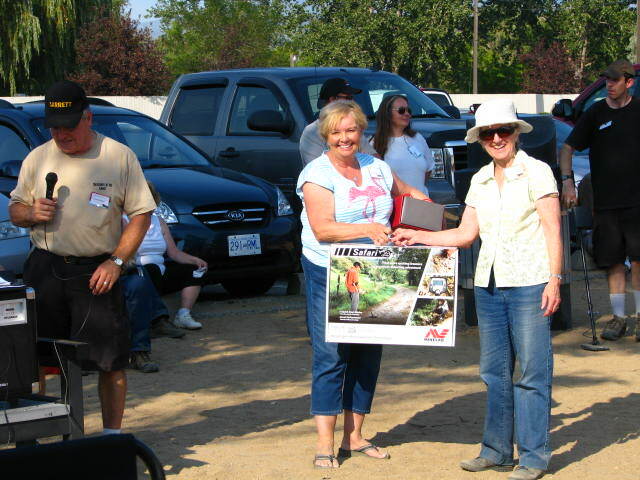 A presentation was also made on Saturday by one of the hunters from out of town. While staying in Penticton they found a ring while detecting and were able to return it to its rightful owners who joined us on the beach for the presentation. All in all, a great bunch of hunters came out and made the 7th annual Treasures in the Sand one to remember! Hope to see you all again next year!! 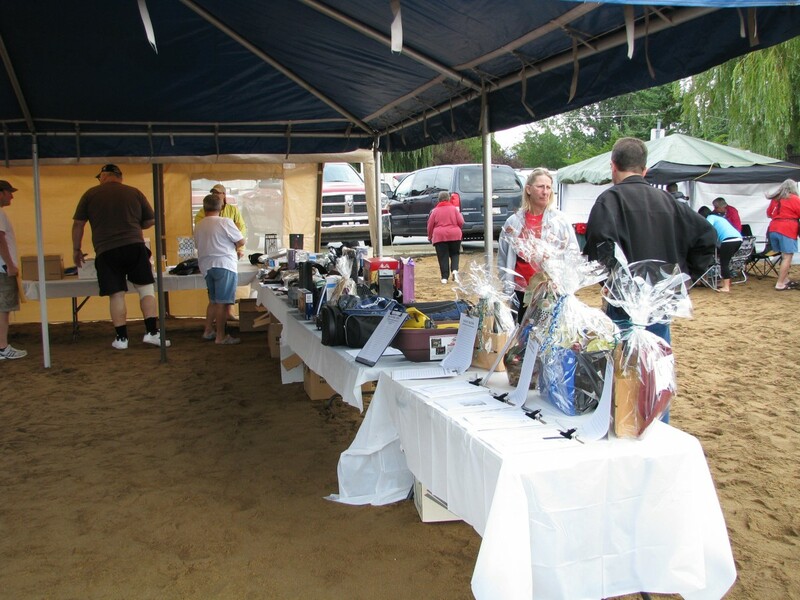 Our 6th annual Treasures in the Sand, held September 5 & 6, 2014, has now come and gone, months and months of planning and replanning and in two days, history! This year we changed our venue. 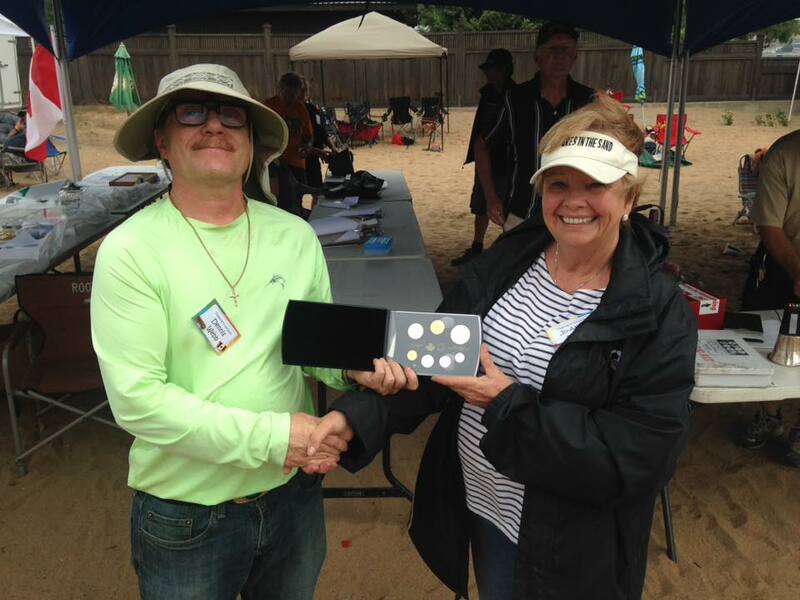 We added a Friday fun hunt and over 50% of registered guests took part, with the major prize of a White’s Pin Pointer going to Raylene Bremner. When all was said and done we ended up with 102 registrations, and six cancellations for a total of 96 people hunting, two of which were children. 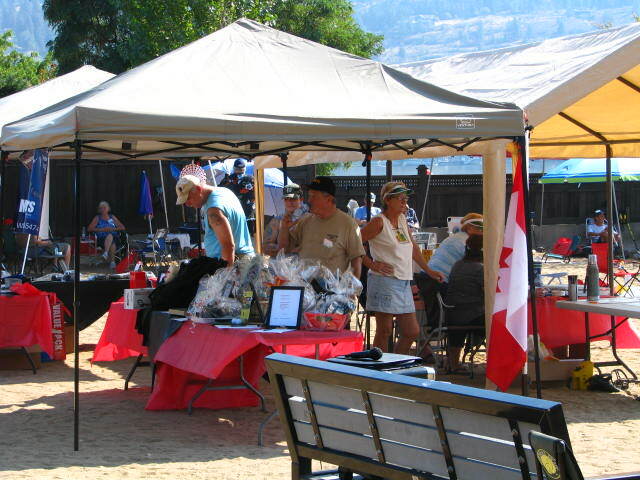 People seemed to enjoy our Silent Auction, as well as the Toonie Hunt. And many people walked away with great prizes. 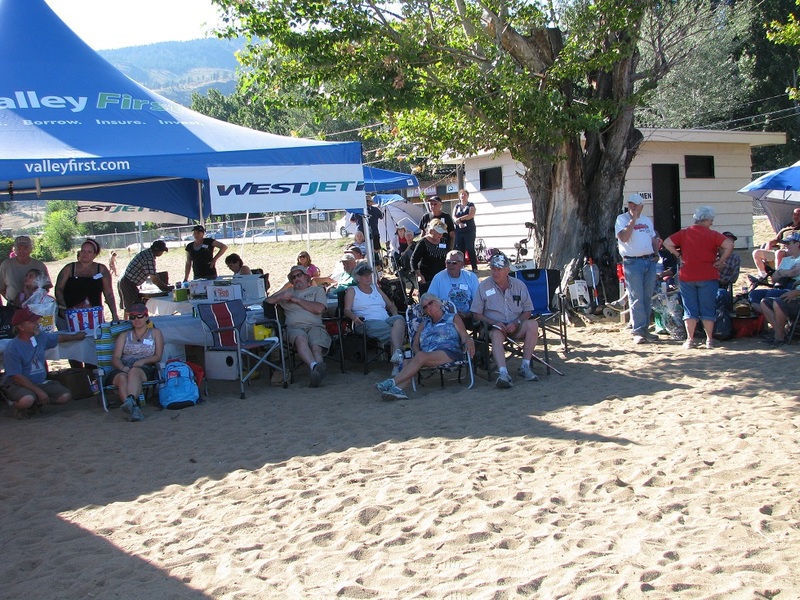 We once again sold all 400 WestJet raffle tickets, bringing our total donated amount to the Penticton hospital to $24,400. 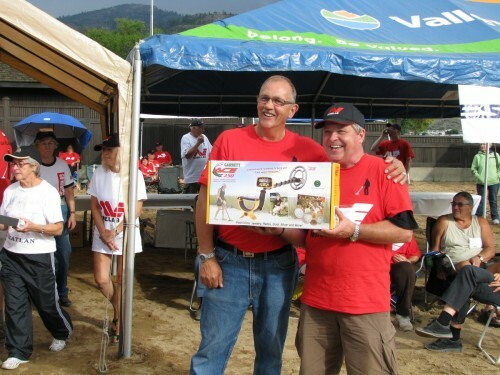 The lucky winner of the WestJet Tickets was Jim Hinchcliffe of Winfield, BC, who was also present at the hunt and seemed thoroughly overjoyed. 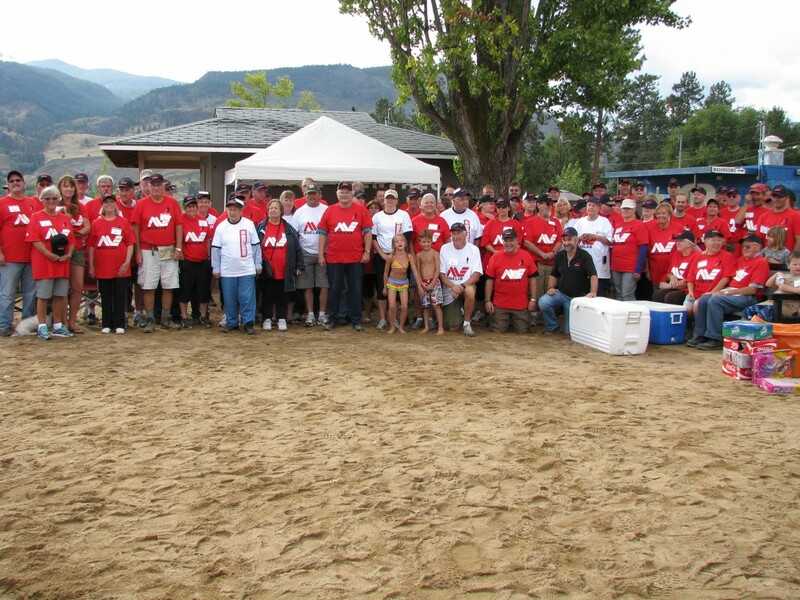 All in all….it was a great hunt with great people…and we can’t wait to do it all again next year!! 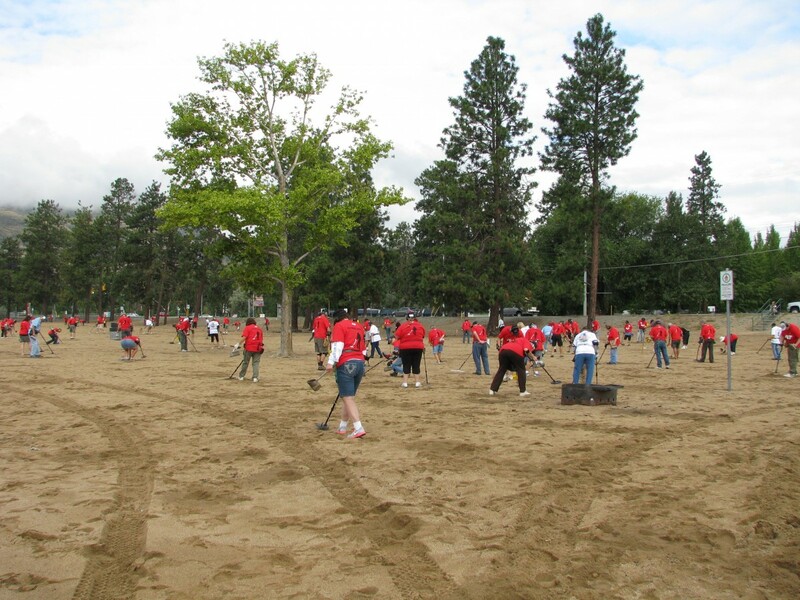 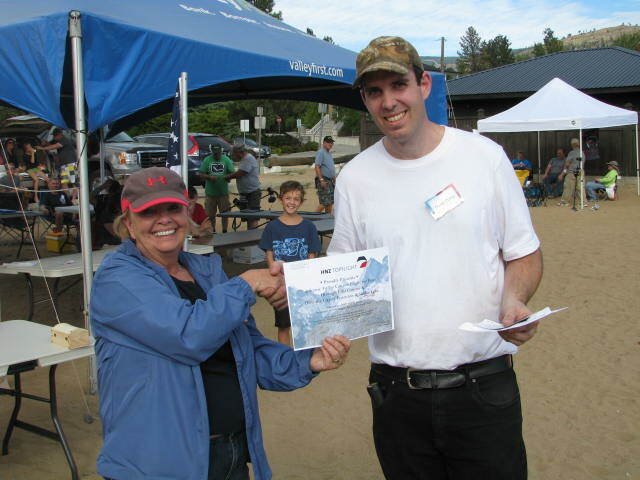 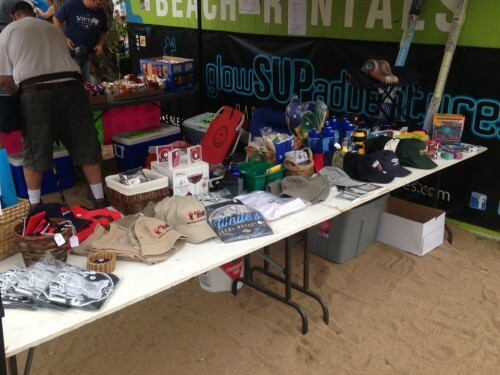 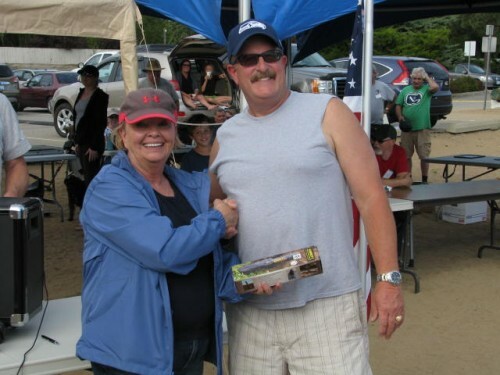 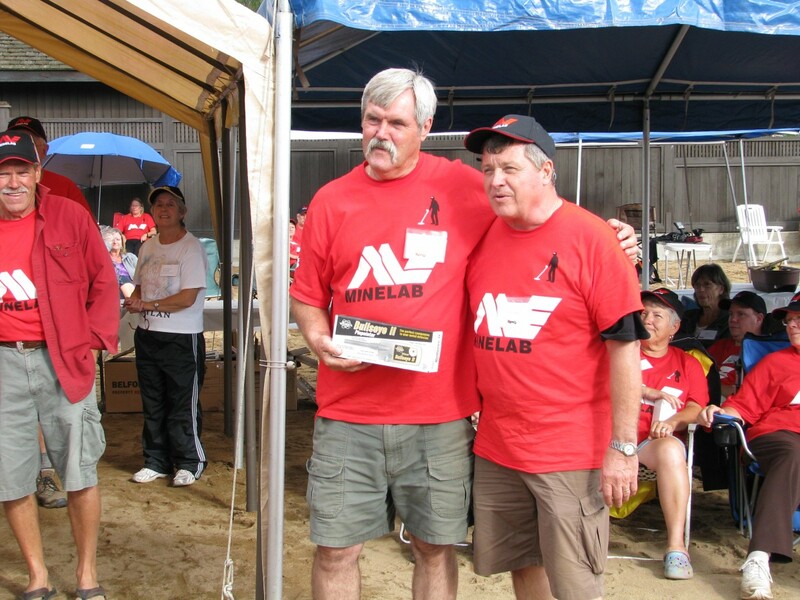 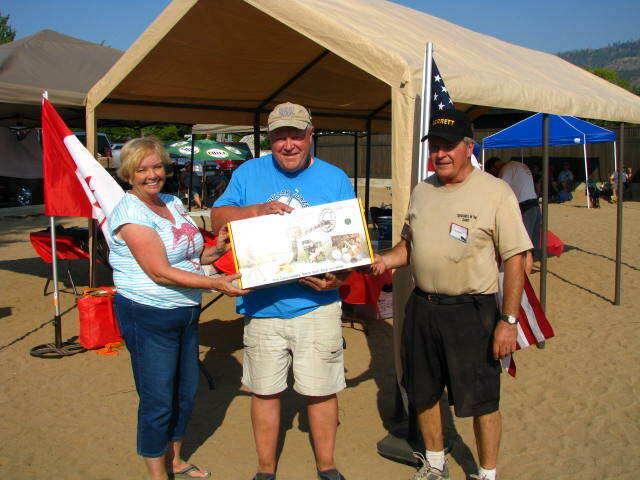 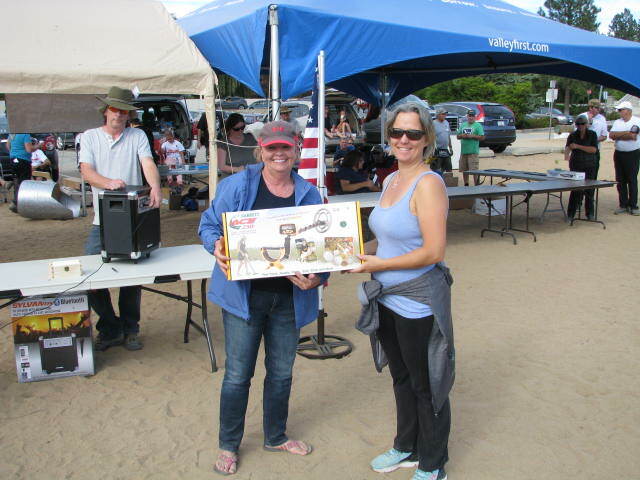 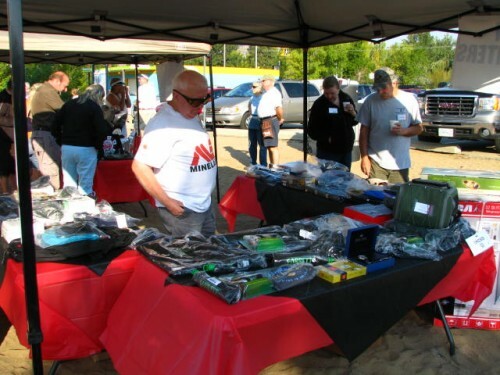 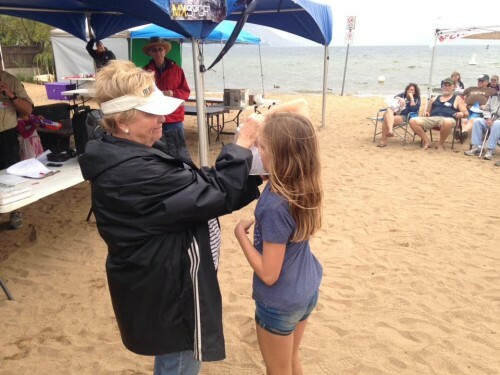 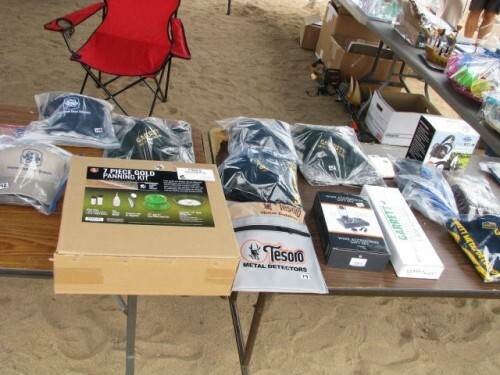 The 5th annual Treasures In The Sand treasure hunt was held September 7, 2013. 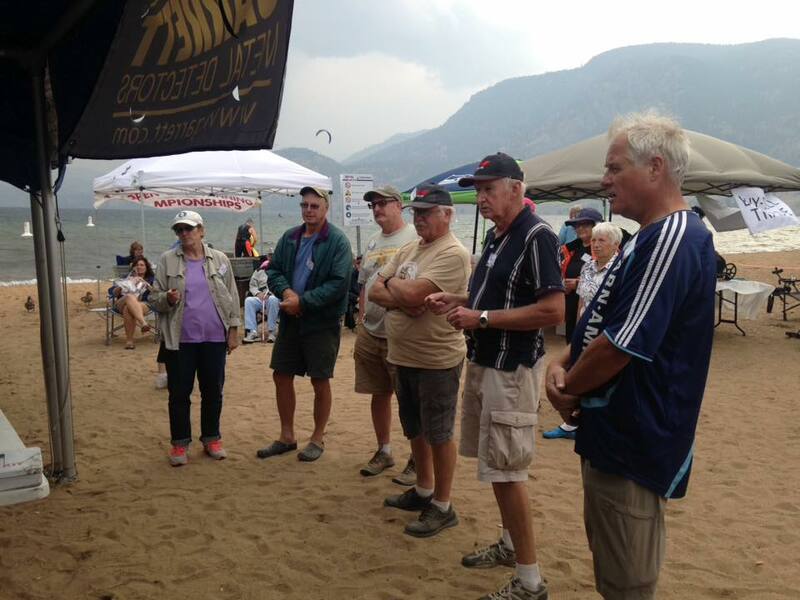 It was a cloudy day with a few rain showers but not enough to dampen the spirits of the club members, participants, and their guests. 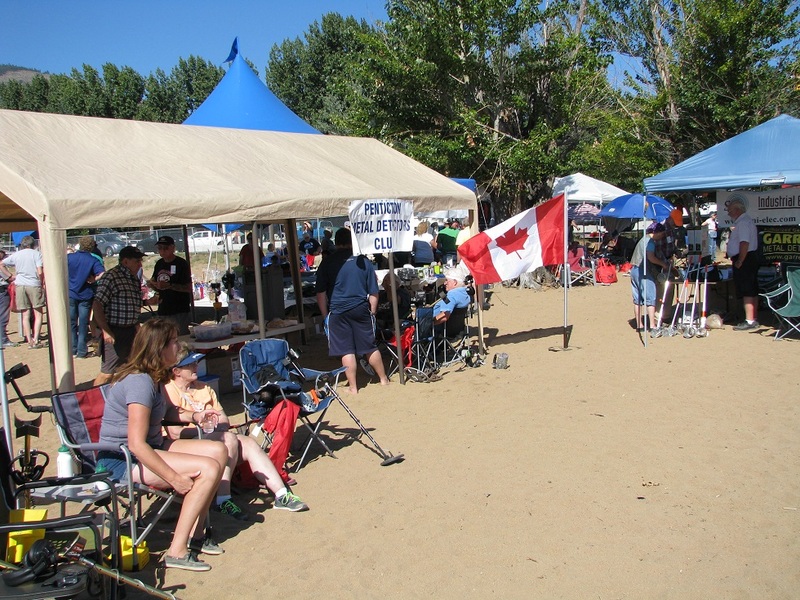 Club members arrived early at Hulley (Sudbury) Beach to setup the tables and tents for the registration and display of the prizes. 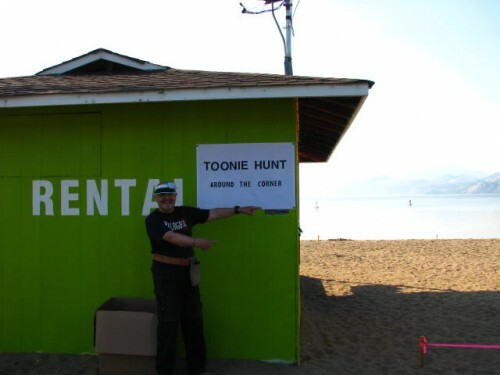 Final registration revealed 107 treasure hunters. 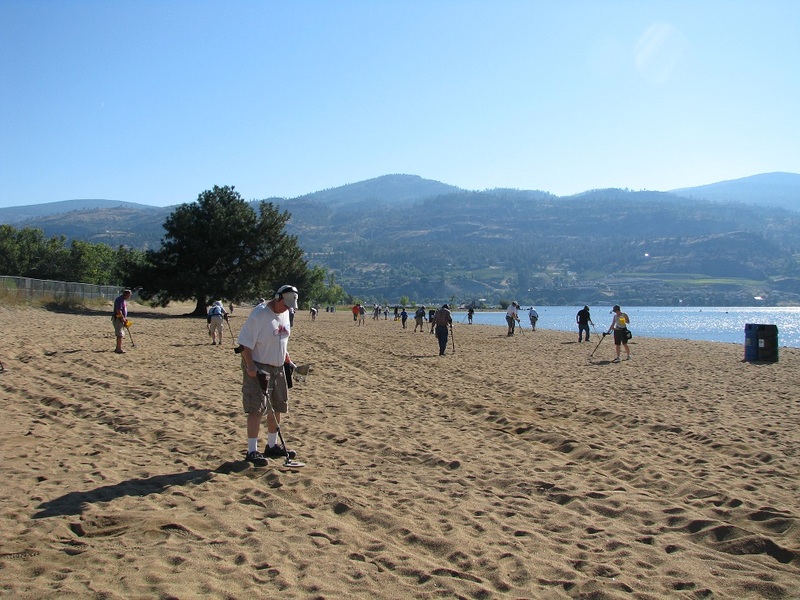 After coin planting on the beach, the first hunt was ready to start at 10:30am. 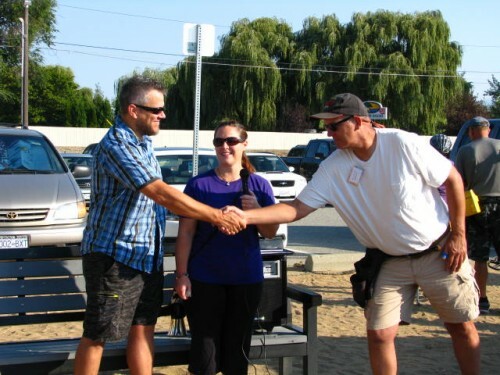 There were two morning hunts before the awarding of token prizes and lunch. 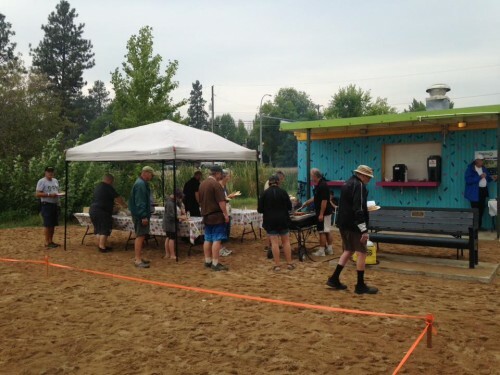 The lunch prepared by club members was a barbeque burger, chips and a drink for all participants and guests. After lunch the beach was again seeded with coins and tokens for the third and last hunt of the day. 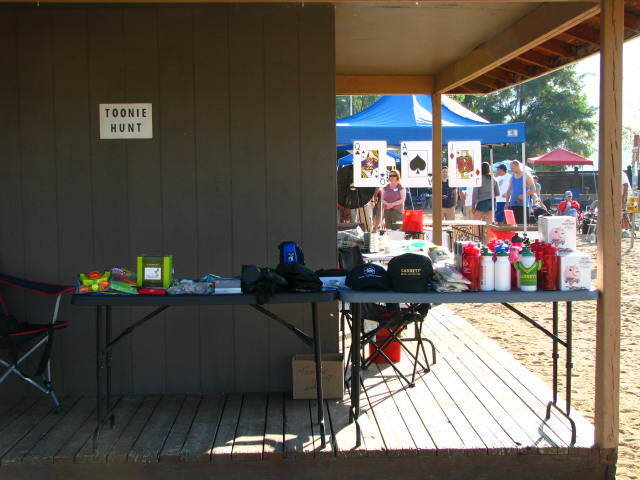 Following the last hunt all tokens were redeemed and we were ready for the closing ceremonies. Major prizes were awarded for the holders of the major prize tokens. Kevin Smith, from Beadazzled The Rock Shop, drew a ticket from all the registered participants and awarded a Minelab Xterra 705 detector to Roberta Freebody, Max Naranjo won the Minelab Pinpointer, Jerry Russel and Hugh McCardel won the Minelab Backpacks, with Hank Vodarek being the lucky winner of the Minelab Geo Coin. 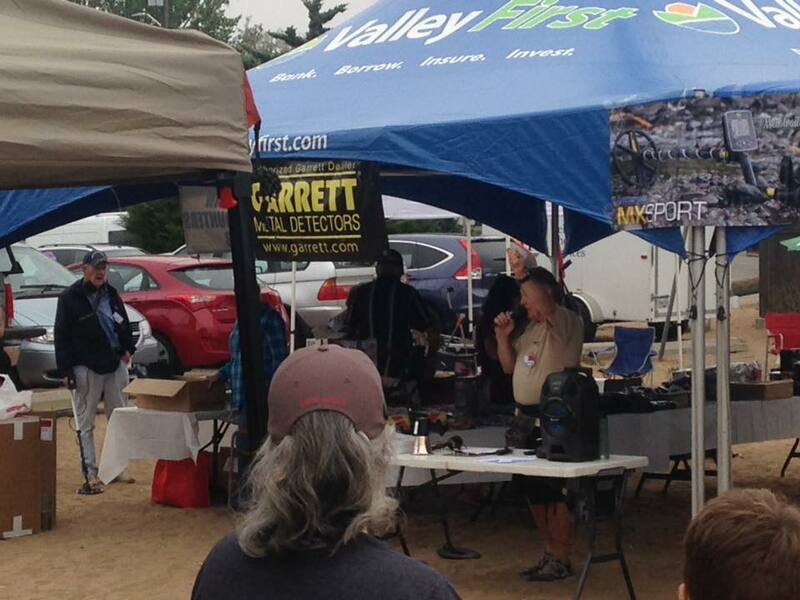 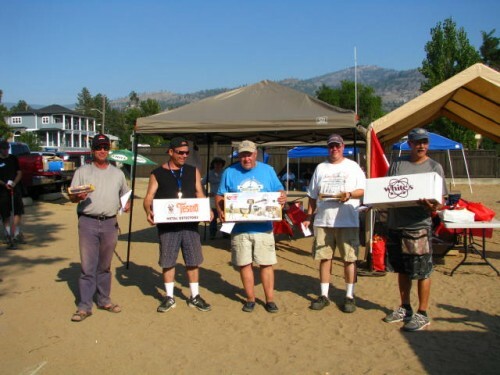 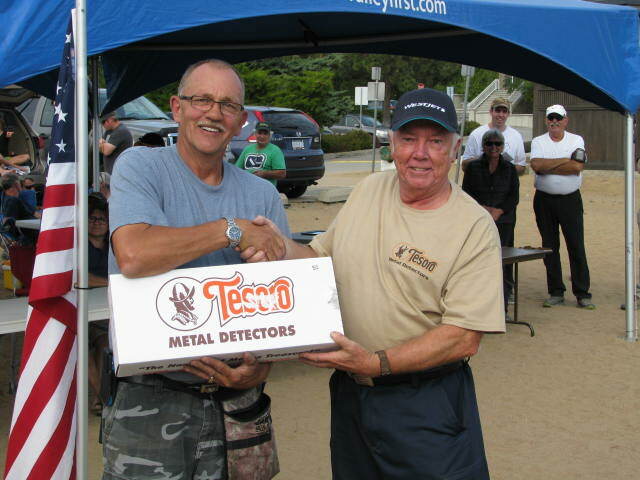 The winner of the White’s Detector was Rudy Van, Garrett Metal Detector was Ken Emmons and the winners of the Garrett Pro-Pointer were Colin Broughton and Mike Harrison. The White’s Bullseye II was awarded to Maretta Saulnier and Glen Harrison. 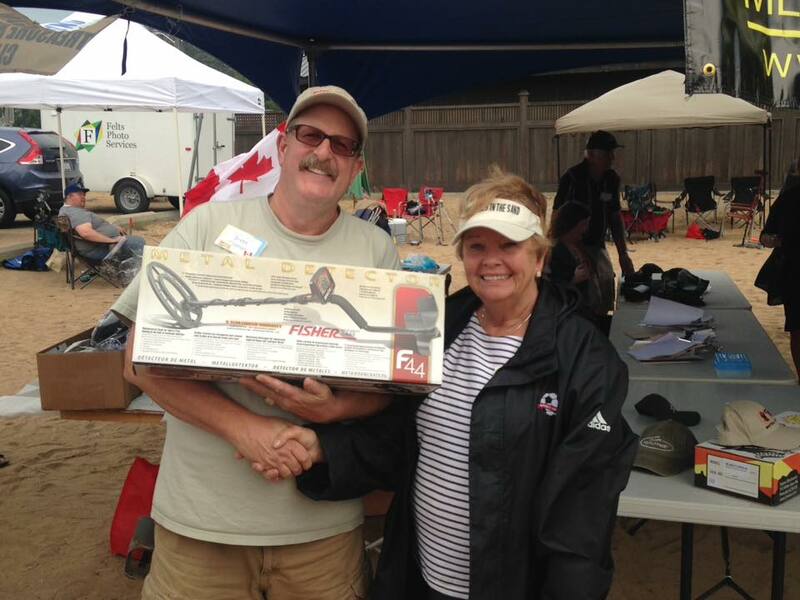 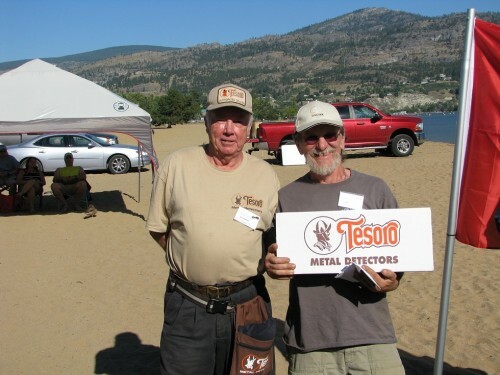 Brian Doctor was the lucky winner of the Tesoro Metal Detector. 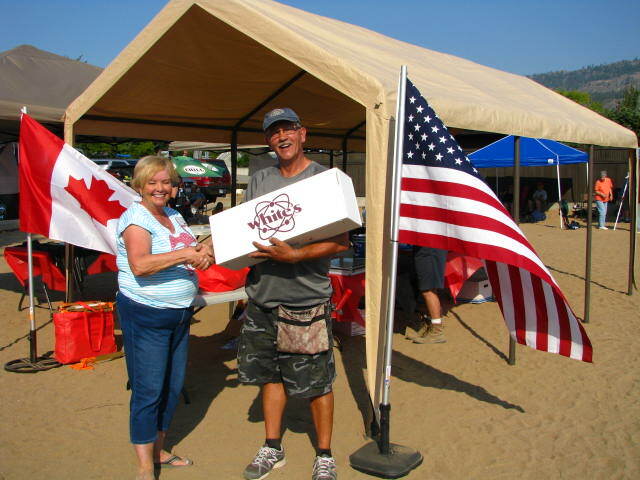 The highlight of the day (as if the other prizes were not highlights) was the draw for the two tickets to any of Westjets Destinations and the lucky winner was Matthew Doctor of Burnaby, BC. 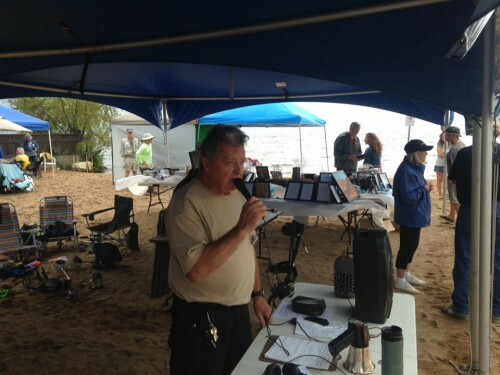 Hank Vodarek, Master of Ceremonies, thanked all the participants and invited them back for the September 6, 2014 Treasures In The Sand.